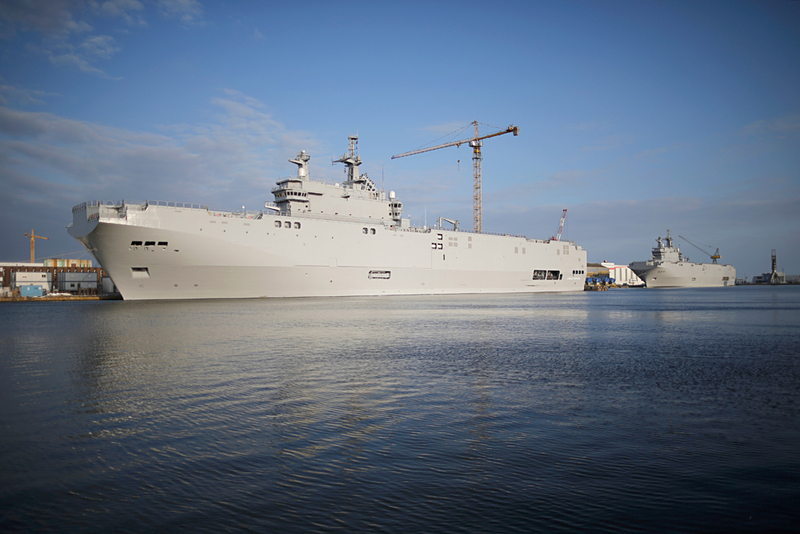 Two Mistral-class helicopter carriers Sevastopol (left) and Vladivostok are seen at the STX Les Chantiers de l'Atlantique shipyard site in Saint-Nazaire, western France, May 21, 2015. The first group of sailors from Egypt will arrive on the ill-fated Mistral helicopter carriers by the end of the week. A Russian sailor talks about how the Russians originally trained on the Mistral ships before delivery was canceled and about the different approaches to equipment in the French and the Russian Navy. The two French-built Mistral-class amphibious assault ships intended for the Russian Defense Ministry but never delivered due to the Ukraine crisis have now accepted a small group of sailors from Egypt for training. The French shipbuilding company DCNS signed a contract with the Egyptian Defense Ministry on Oct. 10, 2015 on the delivery of the two Mistral ships in a deal amounting to about 950 million euros ($1 billion). The two Mistral ships (the Vladivostok and the Sevastopol) were built for Russia at the French STX shipyards in Saint-Nazaire. The contract, worth 1.2 billion euros, was signed in 2011. The transfer of the first carrier, Vladivostok, was to take place in the fall of 2014, but French President Francois Hollande decided to suspend the supply of the ships to Russia over Moscow’s role in the Ukraine crisis. Formally, the agreement between Paris and Moscow was terminated in Aug. 2015. Payments on termination of the contract amounted to approximately 950 million euros ($1 billion). Ultimately it turned out that because of the collapse of the ruble Russia received in national currency almost twice the amount paid in advance. The resale of the Mistral ships by France to a third party had to be endorsed by Russia. Before delivering the ships to new owners, it was necessary to remove all Russian equipment, including communications systems. According to the newspaper's source, the Egyptian generals expressed their desire to have their sailors trained in exactly the same program as the Russians. A Russian sailor who was to be a member of the crew of one of the helicopter carriers told RBTH on condition of anonymity about how the Russian crews of the Mistrals underwent training. According to the sailor, a "book of ship schedules" for training was put together, which made it clear what lessons needed to be passed. The crews of the two Mistrals went to sea separately using only the Vladivostok, since at the time of training the Sevastopol had not even been launched. "There was training in fire safety, embarkation, readying the ship for a voyage and combat alert. The commander was a very responsible person and asked a lot of us,” said the sailor. The two Russian crews arrived in Saint-Nazaire on the Smolny training ship in June 2014, and returned home six months later on Dec. 30. According to the sailor, the training was organized "on the French principle" – a four-shift rotating schedule in which sailors work one day and get three days off. "With regard to fighting fires and flooding, it’s much simpler with the French,” said the sailor. “But the commander decided that our systems are better. We were taught the rules for fighting flooding in a different way, not as the French are taught, but like it’s done on our ships. “With the French everything is focused on people. Something like this – if you don’t put out a fire in five minutes, abandon ship; but our way is to fight to the end, until the very end of the ship. This is the difference between the approaches in relation to technology,” he said. The French also organized a leisure program for the Russians – every weekend they were taken on guided tours in groups of 40 to 60 people. "To various towns, castles, wineries – everybody was delighted," said the sailor. "The civilian population of Saint-Nazaire was upset when we were leaving, too; we were treated well there," he said. The DCNS explains that the ships acquired by Egypt will depart from Saint-Nazaire to their new homeport in the summer of 2016 after training of the sailors is complete. At the moment, Russia and Egypt are negotiating the possible supply to Cairo of Ka-52K shipborne helicopters, designed for the Mistral carriers. If the contract is signed this year, the delivery of the helicopters could begin in 2017.